Facilitated to reflect strengths-based principles our in-person training seeks to draw upon, develop and celebrate the existing strengths (values, beliefs, experience, skills and knowledge) of everyone involved to create a vibrant, collaborative, shared learning environment. Move forward together by learning together. Whether training is designed for your team, a number of programs or includes partner agencies you can be confident that everyone will know what you’re talking about. Well, it’s not always quiet. There will be discussion about what’s important, what we share and what we think. There will be deep thought, personal reflection, a challenge or two and maybe even some laughter. 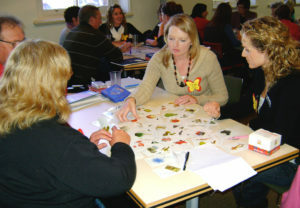 There’ll be hands-on activities, working in pairs and whole groups, the use of images and additional visual resources such as card sets and movies. We specialise in tailoring the content and duration of our in-person and online training to the needs of your organisation at—Your Place or Ours! Experiment with a myriad of ideas, activities and strengths-based tools for engaging with children, young people, adults, groups and communities. Do you want to build a culture within your team of ‘where to?’ rather than focussing on what is not working? Working in human services can be complex, challenging, confusing and, at times, stressful. An engaging and participatory workshop with activities and ideas for enriching facilitated learning in teams, groups, classrooms, workshops and professional development activities. Make self-care a part of your practice, not just an afterthought.